The Gang Starr story is certainly an interesting one. The group was originally formed in 1985 by Massachusetts native Guru (rest in peace) and two artists named DJ 1 and 2-B Down (that's right; DJ Premier was not part of the group's initial proceedings). They also received help from various producers. From what I understand, Gang Starr was not a rap group from the start. I think I remember DJ Premier saying in an interview one time that Guru and his boys were actually singing at the beginning. Intriguing stuff, huh? Well, after a few singles, the original Gang Starr disbanded, and Guru found himself the only member willing to remain. That was when he got in touch with Premo, and thus, the Gang Starr that we have come to know and love today was born. The duo had an illustrious career together, releasing six full-length albums from 1989 to 2003. Sadly, they had a bit of a falling out at the end, but the two thankfully patched things up before Guru's grim, untimely death in 2010. When most people think of Gang Starr, they think of the four albums they released during the '90s. Some may not even know that the first project they actually dropped was No More Mr. Nice Guy in 1989. Now, before getting into the review, I will warn you that the duo's debut was almost nothing like their later work. The choppy, hard-hitting production that DJ Premier is now known for was not yet there on this LP. 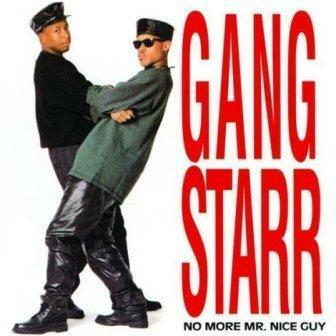 Instead, No More Mr. Nice Guy is a jazzy effort, one that could possibly be referred to as the cousin of Step In The Arena (it wasn't really until Daily Operation that Gang Starr really hit their formula). So, without further ado, let's begin the discography of one of the best groups to ever grace hip-hop. You can already tell how dated No More Mr. Nice Guy is going to sound the second "Premier & The Guru" kicks off. Unlike many other rappers who change up their deliveries as their careers progress, you'll realize here that Guru's flow remained exactly the same from Gang Starr's first album all the way through to their last. That's cool. As far as this song goes, it's decent. Again, very dated (as expected), but decent. If the title of this track doesn't tell you the type of samples DJ Premier used to produce this album (in this case, a Ramsey Lewis sample), then you're lost. Very lost. Anyway, this record is pretty boring overall. Now that's more like it. This sounds a step closer to the type of instrumentals that Premo laced for Guru on Step In The Arena, consisting of an energetic drum loop, a pretty addicting guitar riff and some solid horns. Guru blesses the production with an upbeat performance of his own. This is alright. A little long and repetitive, but alright. That's all I've got. "Gusto" was actually not blessed by DJ Premier. This was laced by DJ Mark The 45 King, one of the producers who used to step behind the boards for the original Gang Starr. You should be able to tell from the first few seconds of the cut that this is not a Premo joint, but with the way he produced back then, you're forgiven if you didn't realize it. Anyway, this song isn't bad, but Guru sounds like he was rapping over the telephone. Then again, hip-hop equipment wasn't exactly state of the art back then, so I guess he's forgiven, too. DJ Premier was so pissed that Guru rolled without him on the previous track that he decided to drop a beat here without Guru's raps. Actually, that probably isn't what happened, but this is a Premo solo instrumental, with a sample of Kool & The Gang's classic "Summer Madness" as the centerpiece. You never see this type of thing in hip-hop anymore. I'm not really sure why the remix comes before the original, but who am I to judge DJ Premier and Guru? This was pretty nice, consisting of a really smooth horn sample and some pretty cool drums. Guru's delivery sounds extremely natural on here, and that's not much of a surprise considering "Positivity" is another one of those tracks on No More Mr. Nice Guy that bears similarities to the records on Step In The Arena. This remix is more well-known than the original version, and with good reason: it's better. Premo's production possesses considerably more energy than most of the rest of the album (even though he utilizes the same sample as the parent version), and while Guru's lyrics are the same as on the original, they simply sound stronger over the beat. Here and there, we get little tastes of Gang Starr's later work on this project, and the "Manifest" remix is one of those examples. DJ Premier's laid-back beat on here is pretty freaking awesome, and Guru indulges with a fine performance of his own. Definitely one of the best songs on No More Mr. Nice Guy. I don't like how Guru's voice echoes throughout, and I wasn't all that impressed with Premo's instrumental, either. Oh well. You know how I said some of the tracks on here parallel the Step In The Arena formula? Well, "2 Steps Ahead" sounds like it could have been on Public Enemy's It Takes a Nation of Millions To Hold Us Back. A classic album? Yes. Incredibly dated? Also yes. Completely irrelevant to this review? Yes as well. I really like the piano sample that DJ Premier used for this; it reminds me of some of his later, more renowned work. Guru seems to ramp up his intensity a bit on this title record, making this an all-around winner. The other cut on No More Mr. Nice Guy that wasn't crafted by Premo. DJ Mark The 45 King is here again, and he lays down a beat that fits right into the rest of the album. That doesn't mean "Knowledge" is all that great, though, because this is pretty boring, and the vocal sample on the hook borders on creepy. The most notable aspect of this song is that it houses the only guest appearance, one that comes in the form of Damo D-Ski. No More Mr. Nice Guy sounds pretty much exactly what you would expect a 1980s hip-hop album to sound like: dated, jazzy and full of braggadocio raps. Not that that's a bad thing, and you know what? Gang Starr's debut was a bit ahead of its time. While no one will confuse this album for any of Gang Starr's best work, there are bits and pieces of it that foreshadow what the duo's career would ultimately become. Yes, it may be a relatively boring listen overall, but don't you want to know about the roots of one of the most legendary groups in hip-hop history? What I really appreciate about No More Mr. Nice Guy is the fact that DJ Premier and Guru do not try to do too much. For the most part, the project is a short listen, as 10 of the 14 songs fall under the four-minute mark. Plus, there are no annoying skits that too many rappers feel necessary to include on their albums. Clearly, Premo had not fully hit his stride yet, and how could you have expected him to at this point? These were some of the first beats of his career, a career that would eventually become one of the most respected ones in rap lore. Guru, on the other hand, is the Guru we know. He never changed up his style, and that just makes him all the more endearing as an artist. Rest in peace, my man. I wouldn't recommend that you go out of your way to listen to No More Mr. Nice Guy, as it is hardly anything groundbreaking. However, again, if you are interested in the history of hip-hop and, particularly, the legacy of Gang Starr, then I suggest you track this down and give it a listen. You may even find yourself pleasantly surprised by what you hear.